Probably the earliest known mineshaft on the Shipley West site dates back to 1795 known as the Engine Pit. 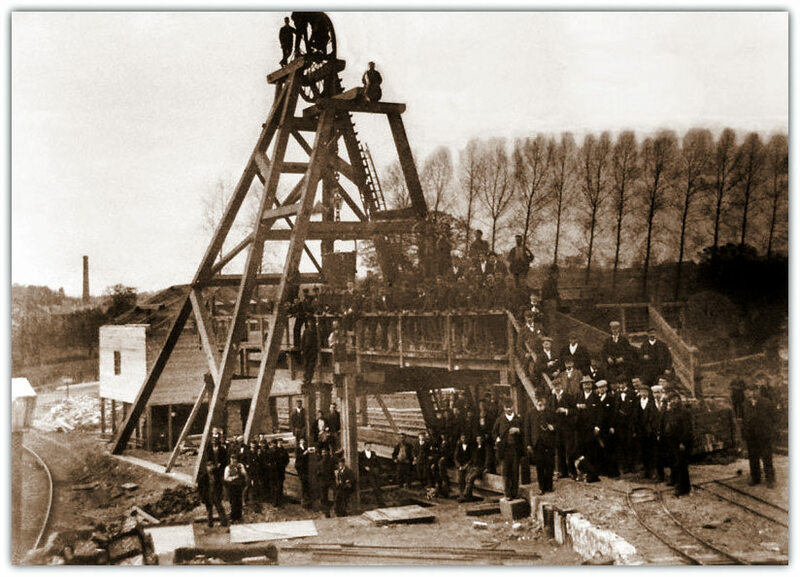 In the 1850's several smaller collieries were operating along Mapperley Brook, from Brook Farm (now owned by Mr. W. Smith) eastwards towards the Nutbrook Canal. The Whitehouse Iron works lease commenced in 1848 closing in 1886. West Hallam 1, which had 2, shafts 117 yards and 120 yards deep respectively. West Hallam 2 105 yards deep closing c1880. West Hallam 3, which worked the hard coal, shallow seams. With the departure of Messrs Whitehouse from the site most of the upper (shallow) coal measures had been worked out. No. 1 Wingfield (Kilburn) 380 yards deep.No. No. 2 Wingfield (Kilburn) 387 yards deep. After the Ironworks had ceased production in 1881 several thousand tons of furnace slag were left on the site. This was later required for ballast and road building. A purpose built plant was erected for breaking up this material and the GNR laid a line and sidings to removed the processed material from the site. This process commenced in 1896, closing in 1915 by which time all evidence of the ironworks had disappeared. By 1930 all coal mining had ceased with all the shafts being sealed in 1941. Following this there was heavy demand for coal during the Second World War and the site was again reopened in 1943 as a coal disposal point. With opencast coal being processed from all the surrounding sites. This was finally closed in 1964, with the equipment and buildings being dismantled in 1986. Bringing an end to 200 years of coal mining related operations on this huge site. Since this period nature as taken over, turning it into a large natural nature reserve. Giving pleasure to hundreds of walkers, bird watchers, nature lovers, Industrial historians and Industrial Archaeologists. Following problems with water shortages in 1854 on the Nutbrook Canal, a reservoir was built using Mapperley Brook as the main feeder. A 150 yard dam wall remains constructed of stone and cinders. This is of importance showing early canal construction techniques and should be preserved. During later mining operations on the construction described above, the dam was breached in the late 1880's. This was carried out to prevent flooding in the nearby underground workings. On carrying out this work an older circular brick mineshaft was revealed. This shaft approximately 5ft diameter, and stands 20ft high. It is thought to have been built c1820, and is an important structure showing early mine shaft building techniques. It should remain as a preserved Industrial monument on the site.